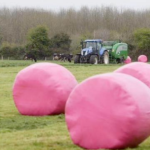 Further to the success of the pink wrap initiative this year in which some IFFPG members made a contribution to breast cancer awareness charities for every roll of pink wrap sold, IFFPG will make a contribution next year to the Irish Cancer Society for every tonne of pink wrap recycled (photo of pink wrap). So we are asking you to make sure that you recycle your pink wrap next year and in doing so not only help the environment but also support a very worthy charity. Please be aware that the pink wrap can be recycled together with wrap of other colours.